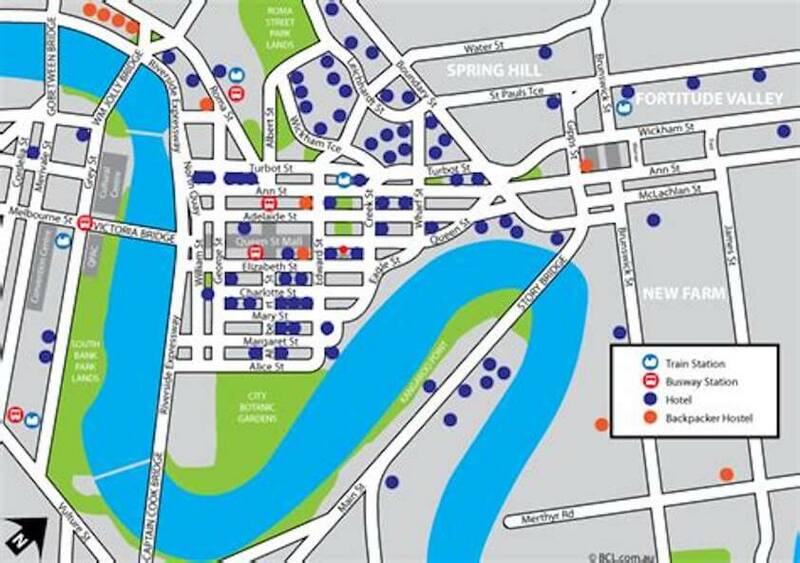 Brisbane City Map with Brisbane hotels and motels marked. With Booking.com, you can book accommodation in Brisbane, Ipswich, around Queensland, and Australia, weeks or months ahead to get best choice, especially in busy school holiday seasons, Christmas, New Year and for special events. Guest reviews and Maps. Booking.com charges no booking fees. You pay the hotel when you stay. This map is intended as a guide to Brisbane hotels only and is not exactly to scale. Booking.com charges NO booking fees. You pay the hotel when you stay. day or two before the stay at no charge. Genuine guest reviews. See what other guests say. Reviews are only accepted from people who have actually stayed at the hotel. Maps showing the location of the hotel, and nearby alternatives. Pay the hotel direct when you stay.